Model has not yet fully completed the peer review and collegial review process and final modifications may be required of the developers. Model may not be cited or circulated until that process is complete. It may be used in identifying and evaluating restoration actions with assistance from content experts. Model is appropriate for use by experienced evaluation team with input from content experts as necessary. The purpose of this conceptual model is to aid management decisions for the continued persistence and recovery of Sacramento splittail. 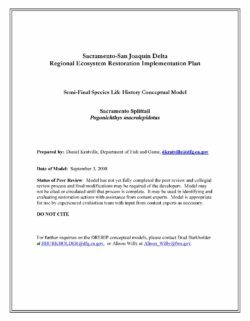 This model, along with the suite of models developed through ERP as well as other information and tools, is intended to be used for evaluating proposed restoration actions for the Delta and throughout the species geographic range. It is a qualitative life-cycle conceptual model that attempts to bring together many sources of information to build a comprehensive document that represents the current state of knowledge for the species. It is not a quantitative model however. It will not provide quantitative limits on species take or population number outcomes. It will only provide an indication of anticipated population response (i.e. increase or decrease with a magnitude of x or y) based on the most current scientific knowledge. 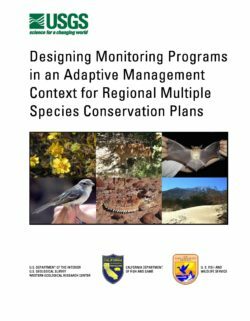 With this knowledge, proposed restoration actions can be grouped and a positive population response can be developed through an adaptive management framework. The model must be read and understood in its entirety and does not provide users/readers quick solutions or answers. The entire life-cycle of the animal must be understood by decision makers if they intend to make sound choices in the future. 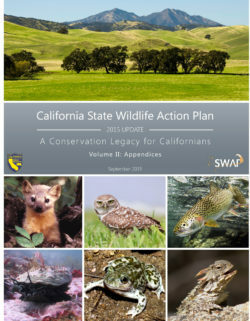 The conceptual model diagram and associated tables can be used to focus the reader on potential species and population limiting factors given the current scientific understanding under current conditions. The model has a specific emphasis on the Delta; however the entire species range must be considered when population level responses are of concern. For this reason the geographic scope of this document is beyond the legal boundaries of the “Delta”. This is not intended to be the final version of this conceptual model. As new information becomes available through research and in the scientific literature, this model will be updated as time allows providing managers with the most current information available. This conceptual model relies heavily on the extensive work done by Peter Moyle and others in their 2004 white paper Biology and Population Dynamics of Sacramento Splittail (Pogonichthys macrolepidotus) in the San Francisco Estuary: A Review which was published in the San Francisco Estuary and Watershed Science online journal. Content in the model is taken from that review unless otherwise indicated. These sections will be introduced with a citation to Moyle et al. 2004. This model also takes into account new research on Sacramento splittail which has occurred subsequent to the white paper. The Yolo Bypass Wildlife Area (Wildlife Area) comprises approximately 16,770 acres of managed wildlife habitat and agricultural land within the Yolo Bypass (Bypass). The Bypass conveys seasonal high flows from the Sacramento River to help control river stage and protect the cities of Sacramento, West Sacramento, and Davis and other local communities, farms, and lands from flooding. Substantial environmental, social and economic benefits are provided by the Yolo Bypass, benefiting the people of the State of California.
? present the environmental documentation necessary for compliance with state and federal statutes and regulations, provide a description of potential and actual environmental impacts that may occur during plan management, and identify mitigation measures to avoid or lessen these impacts. This LMP was prepared through a partnership between DFG and the Yolo Basin Foundation (Foundation) and with the benefit of an extensive public-input program. DFG provided overall guidance to the planning process and was responsible for all decisions regarding the content of the LMP. The Foundation was responsible for coordinating substantial stakeholder outreach and facilitating stakeholder input in the LMP development. 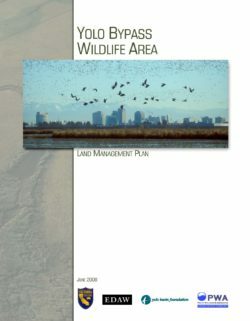 The Foundation was instrumental in the development of environmental education and interpretation programs at the Yolo Bypass Wildlife Area and helped facilitate the documentation of these programs in this plan. The public-outreach program featured six focus group meetings conducted before initiation of LMP development (2002); a total of 37 Yolo Bypass Working Group Meetings (1999 to 2006; updates on developments at the Yolo Bypass Wildlife Area have been a frequent topic of discussion); one advertised public meeting for initial input (December 12, 2005, in Davis, attended by 30 persons); five additional focus group meetings to receive input on the Preliminary Draft LMP (March and April, 2006), one advertised public meeting for input on the Draft LMP and Initial Study. 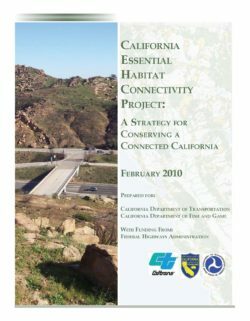 Appendix A provides a summary of the comments received at the public meetings and examples of the various communication devices that were used to publicize the planning process. The Klamath River basin, which spans parts of southern Oregon and northern California, has been the focus of a prominent conflict over competing uses for water. 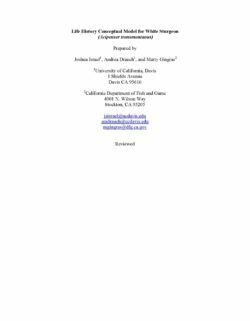 Management actions to protect threatened and endangered fish species in the basin have left less water available for irrigation in dry years and heightened tensions among farmers and other stakeholders including commercial fishermen, Native Americans, conservationists, hunters, anglers, and hydropower producers. 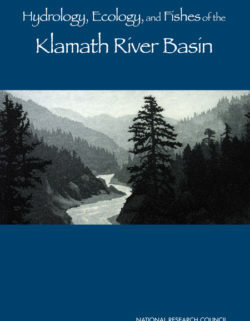 This National Research Council report assesses two recent studies that evaluate various aspects of flows in the Klamath basin: (1) the Instream Flow Phase II study (IFS), conducted by Utah State University, and (2) the Natural Flow of the Upper Klamath Basin study (NFS), conducted by the U.S. Bureau of Reclamation (USBR). 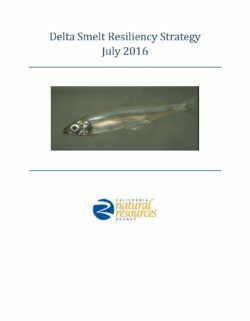 The report concludes that both studies offer important new information but do not provide enough information for detailed management of flows in the Klamath River, and it offers many suggestions for improving the studies. The report recommends that a comprehensive analysis of the many individual studies of the Klamath river basin be conducted so that a big picture perspective of the entire basin and research and management needs can emerge. The Instream Flow Study Phase II did not include important water-quality attributes, such as dissolved oxygen levels, nutrient loadings, contaminants, and sediment concentrations, although each has important implications for the vitality of the fish populations of the Klamath River. The Natural Flow Study and the Instream Flow Study Phase II were major science and engineering investigations, but the linkage of one to the other was only partially achieved. The Natural Flow Study was seriously compromised by several fundamental issues, including its choice of a basic approach for understanding natural flows, choices of the models for calculations, and serious omissions of factors likely to influence river flows at the Iron Gate Dam gauge site. The basin and its biota have changed so much in the past century that the implications for the fishes of restoring natural flows are not clear. The committee concluded that the Natural Flow Study includes calculated flows that are at best first approximations to useful estimates of such flows. The committee found important shortcomings in the Instream Flow Study Phase II and its use of various models and data. Two major shortcomings use of monthly data and lack of tributary analyses are so severe that that they should be addressed before decision makers can use the outputs of the study to establish precise flow regimes with confidence. The most important outcome of the Instream Flow Study was that it indicated that increases in existing flows downstream from Iron Gate Dam probably would benefit fish populations through improved physical habitat associated with more water and through reduced water temperatures. When the science needs for the basin are better characterized, the individual studies necessary to create a sound science-based body of knowledge for decision makers and managers will be more easily identified. current flow regime. These are improvements in flow because they include intra- and inter-annual variations and probably will enhance Chinook salmon growth and young-of-the-year production. is not possible to know how well the recommendations apply to any one species or to all the species as a whole. Indeed, most of the information was from Chinook salmon, which suggests that confidence in its applicability to that species would be greater than to other species. of the representativeness of the reaches used for detailed study, and the statistical approach to analyze the calculated set of instream flows did not use normalized data and did not have provisions for identifying serial autocorrelations. 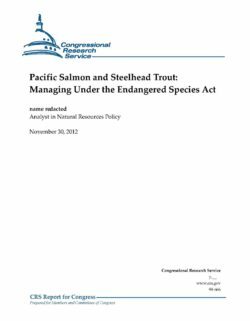 Along the Pacific Coast, 28 distinct population segments of Pacific salmon and steelhead trout are listed as either endangered or threatened under the Endangered Species Act (ESA), with three additional populations identified as “species of concern.” While no species of anadromous trout or salmon is in danger of near-term extinction, individual population segments within these species have declined substantially or have even been extirpated. The American Fisheries Society considers at least 214 Pacific Coast anadromous fish populations to be “at risk,” while at least 106 other historically abundant populations have already become extinct. Human activities—logging, grazing, mining, agriculture, urban development, and consumptive water use—can degrade aquatic habitat. Silt can cover streambed gravel, smothering fish eggs. Poorly constructed roads often increase siltation in streams where adult salmon spawn and young salmon rear. Removal of stream-side trees and shade frequently leads to higher water temperatures. Grazing cattle remove stream-side vegetation and exacerbate stream bank erosion. Urbanization typically brings stream channelization and filled wetlands, altering food supplies and nursery habitat. Habitat alterations can lead to increased salmonid predation by marine mammals, birds, and other fish. Dams for hydropower, flood control, and irrigation substantially alter aquatic habitat and can have significant impacts on anadromous fish. In addition, natural phenomena stress fish populations and contribute to their variable abundance. Current management efforts aim to restore the abundance of ESA-listed native northeast Pacific salmonids to historic, sustainable population levels. The National Marine Fisheries Service (NMFS, also popularly referred to as “NOAA Fisheries”) in the Department of Commerce implements the ESA for anadromous salmonids. When a federal activity may harm an ESA-listed salmonid, the ESA requires the federal agency to consult with NMFS to determine whether the activity is likely to jeopardize the survival and recovery of the species or adversely modify its critical habitat. Prior to the listing of salmonid “evolutionarily significant units” (ESUs) under the ESA, the Northwest Power and Conservation Council took the lead in the Columbia River Basin under the 1980 Pacific Northwest Electric Power Planning and Conservation Act, by attempting to protect salmon and their habitat while also providing inexpensive electric power to the region. Under this effort, federal agencies and public utilities have spent hundreds of millions of dollars on technical improvements for dams, habitat enhancement, and water purchases to improve salmon survival. Recent years have seen an increased interest by state governments and tribal councils in developing comprehensive salmon management efforts. 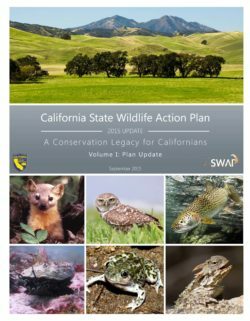 This report summarizes the reasons for ESA listings and outlines efforts to protect ESA-listed species.